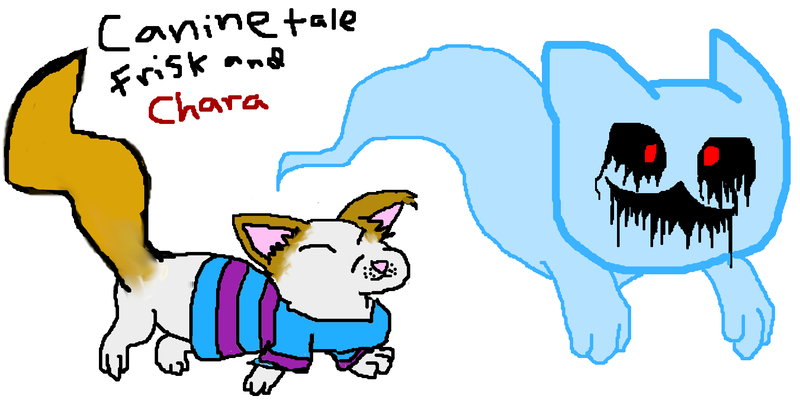 Caninetale is an AU where all the monsters are dogs and all the humans are cats. Instead of trapping the dogs in the underground, however, the cats had thrown them into the mountain's caverns knowing they could not climb as easily as cats could. Dogs and cats both have the same type of soul, however, when harnessing a cat's soul, it can cause body changes, allowing a dog to climb out with one. 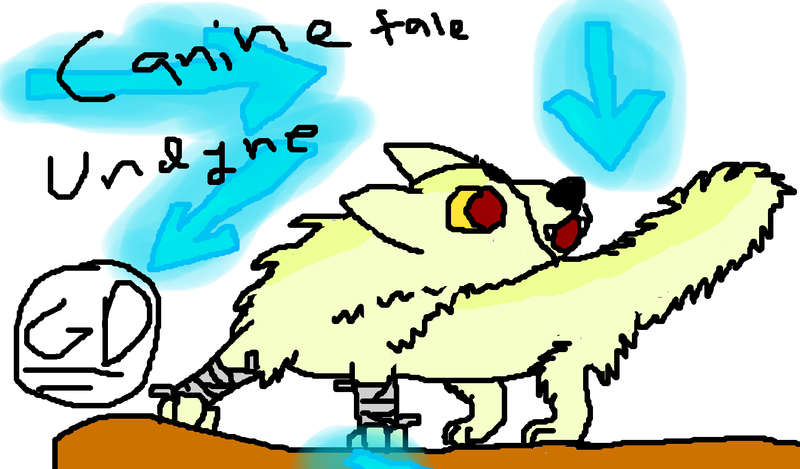 When the first cat (Chara) fell into the caverns, the pup named Asriel took her in as if another dog. Asriel was unaware the difference between a dog and a cat causing some conflict. Toriel and Asgore, (the rulers of the underground) still took the cat in, despite the many conflicts that would occur. This was a major mistake. Due to the many stories told on the surface, Chara went on a genocidal rampage. Despite Chara's many killings, when Chara was put down, Asriel took her soul and decided to bring her body back to where she originally came from. When Asriel climbed to the surface, he was startled to see another cat. As Asriel placed the body of Chara's down, the nearby cat shoved Asriel back down. The large fall had killed Asriel in front of his family. This was the last time the cats had ripped something from the dogs. Asgore ordered that all cats are exterminated when spotted in the caverns. Toriel, however, knew that it could have been a misunderstanding. Toriel left to go live in the Ruins. Asgore continued to live in New Home. The other 5 each died before getting to Asgore. The dogs that killed fallen cats each attempted to escape and all died minutes after climbing up. This destroys the cat soul. If a cat takes a dog soul, they will be better at combat. If a dog has 7 cat souls they will become very swift and sly. If a cat has 7 dog souls they will become very grandest at combat. Frisk is the 7th cat to fall down. Frisk is a Turkish Van, the cat breed known for liking water. Toriel is the caretaker of the Ruins. Toriel is the queen of the underground. Her breed is a Golden Retriever. Sans is the laid-back brother of Papyrus. Sans holds incredible powers in the genocide path. 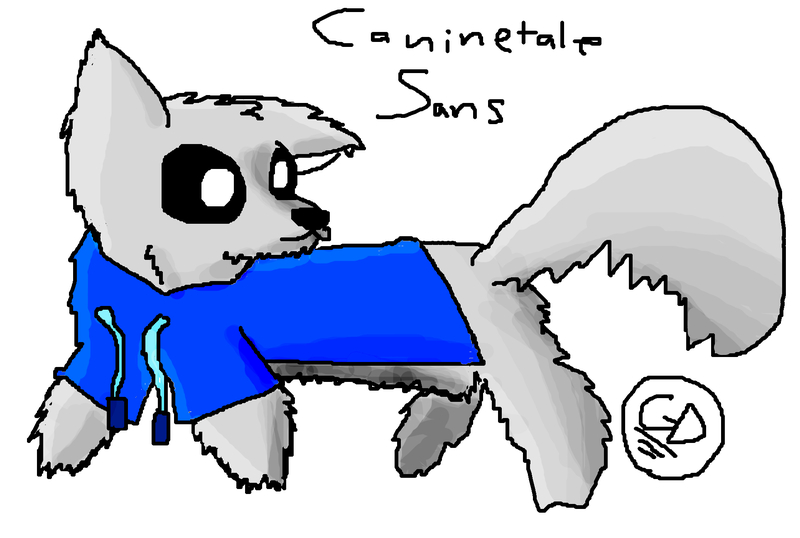 Sans is a Siberian Husky. Unlike the Sans in Undertale, he does not have an undershirt. Papyrus is the self-centered, kind, egotistical brother of Sans. He want's to be the leader of the K-9 Unit (Which is also the royal guard). 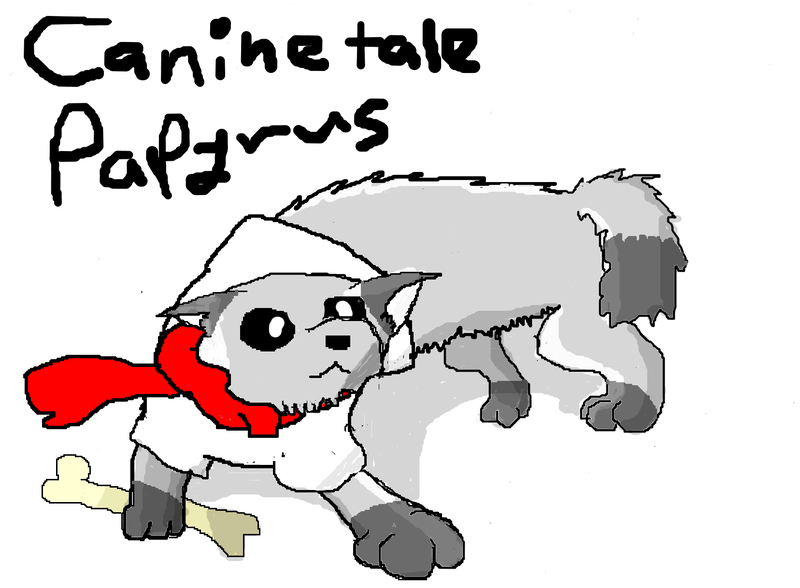 Papyrus is a Siberian Husky. The Mad Dummy is a Manikin Chihuahua who is angry at the player for interacting with the manikin at the beginning of the game. He wields a single knife. 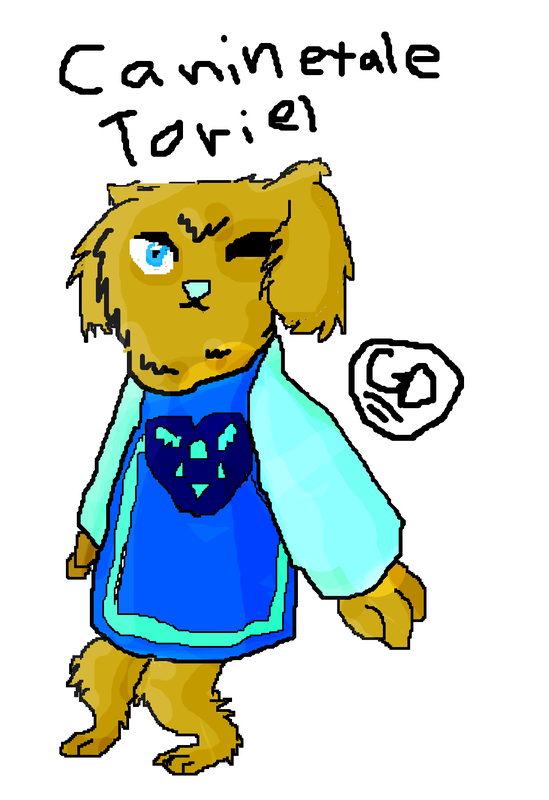 Undyne is an Akita Dog that is the leader of the royal guard. Undyne is also in love with Alphys but is unaware that her love interest Alphys feels the same way until Frisk brings them together via a date. Temmie is a Nova Scotia Duck Tolling Retriever. A group of them live in a village where they sell bacon flakes. The Annoying Dog is a Pomeranian who absorbs artifacts. 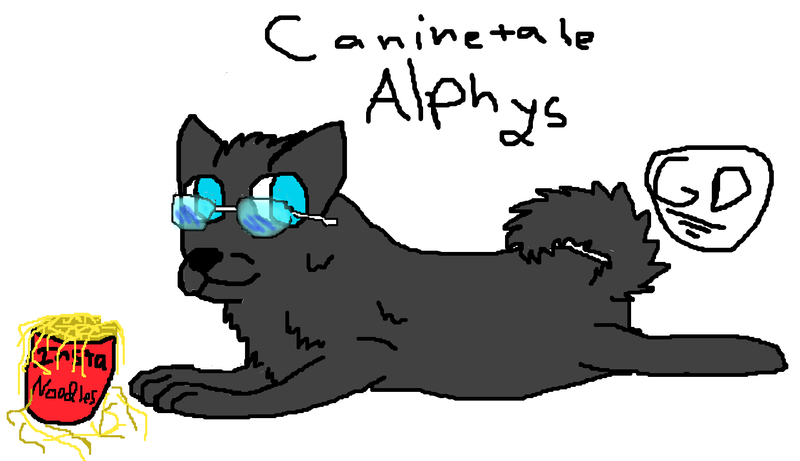 Alphys is a shy Schipperke who is the Royal Scientist. Mettaton is a K-9 Ultra Canine Unit who lives for fame on his 56 TV shows. 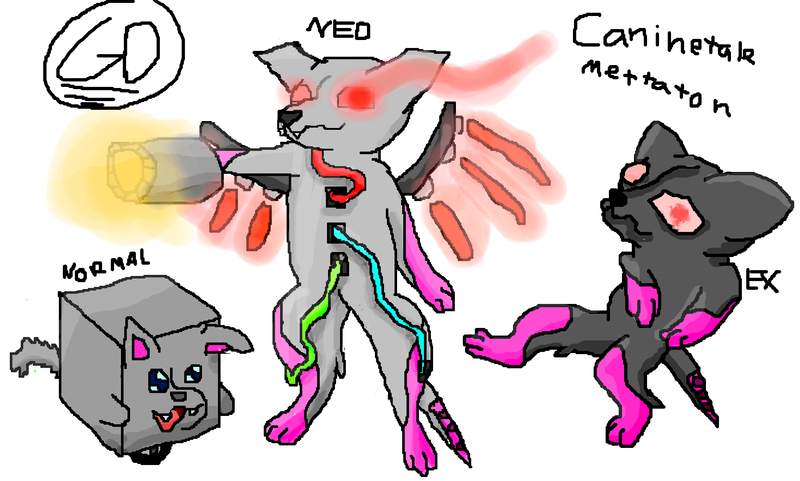 His NEO design is based on an L3 military robot terminator dog, Mettaton EX from normal undertale, and a Mewtwo Deoxys fakemon fusion. Muffet is a Pug that wants to fund for flees via their fundraiser. Mettaton EX is the Mega form of his K-9 Ultra self. He can become a NEO form in the Genocide route. 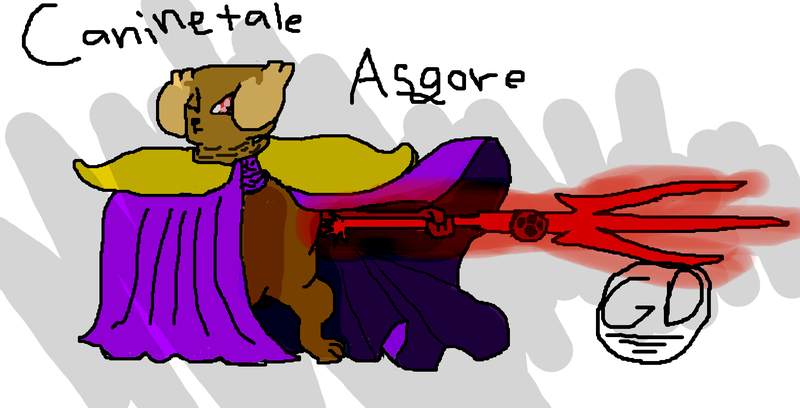 Asgore is the ruler of the underground. After his wife left and his child died, he started a life of solitude. He is a Neapolitan Mastiff. The Amalgams play a prominent role in saving Frisk from Undyne, however, Frisk cannot completely identify them until they make it to the True Lab. This is a soon to be created roleplay. The roleplay will take place after the true ending. Who you want to be I will consider having you as one of the characters. You can have a maximum of three characters. I will take-over Sans, Error Sans, and Mettaton because they are overpowered and I can't risk having a troll kill everyone with Gaster Blasters, Blue Strings, or the argument that Mettaton can't die because of how s/he was originally a ghost. Also, the characters from this AU are going to be shown as WOOF!Characters because CT! is a already existing AU (That being Consoletale). Because Error and Ink canonically work against each other, they seemingly "mess with each other" and "play fight" instead of fighting to the death. Monsters from other AUs (Underfell, Outertale, Axetale, ect.) 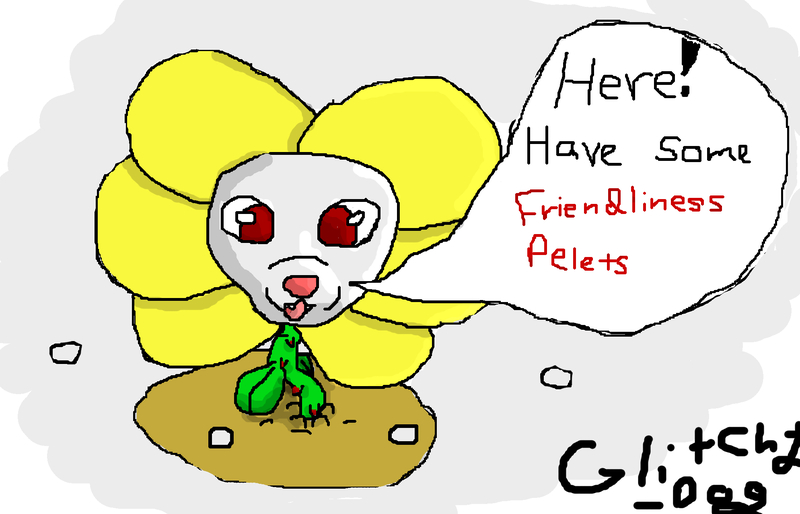 will act as new enemies instead of the originals from Caninetale or Undertale, these monsters will not be played by other players. This RP takes place after the True Pacifist Ending. This AU supports any ship that the Players make sail (Other than changing the Error x Ink ship). In this AU, Frisk isn't a mute. In this AU, Frisk is Female. The Paperjam x FRESH!Sans ship is also cannon in the RP.